A dedicated cyclist with a degenerative disorder spun into Huddersfield on a huge charity challenge. Leanne Owen is adamant that nothing will get in the way of the mammoth 477-mile bike ride she is currently part way through, including the Parkinson’s disease that she suffers from. Leanne, 47, whizzed into Huddersfield’s Sainsbury’s Shorehead to meet the public and visit members of the town’s Parkinson’s UK branch. It is one of 24 branches in Yorkshire and the Humber that she plans to visit this week. She wants to raise awareness of the condition, which mainly affects the motor system of the central nervous system and of the charity, which offers support to around 127,000 people with it in the UK. Despite having difficulty in carrying out some everyday tasks, Leanne, a retired fire fighter from Pontefract, found that the bicycle has helped her continue living life to the full. 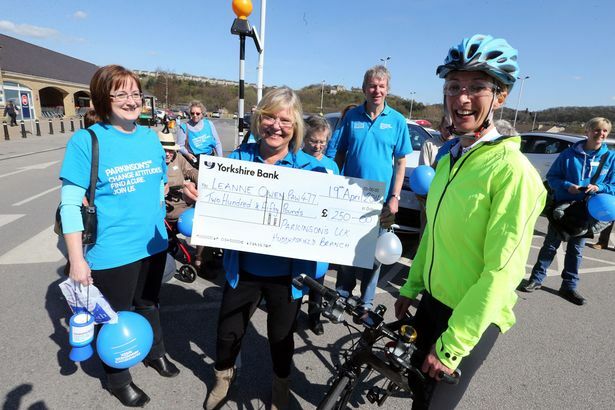 Leanne Owens arrives at Sainsbury's, Shore Head, Huddersfield, on the latest leg of her Parkinsons Awareness cycle around Yorkshire and receives a cheque from Huddersfield Parkinsons Treasurer Catherine Mills. She is undertaking her challenge with support from people she knows and companies. Parkinson’s occurs due to a lack of dopamine, which acts as a messenger to help control body movements. It is caused when specific nerve cells inside their brain have died and makes movements slower, which can make carrying out simple tasks difficult. It can also cause other problems such as with balance, nerve pain, tiredness, problems with urination, dizziness, swallowing difficulties, depression and constipation. The three main symptoms of Parkinson’s are tremor, muscle stiffness and slowness of movement.